Imagine: a wilderness setting; warm, gentle breezes and the sound of the surf filling the air and greeting you; waking each morning for an exciting day of archaeological exploration! Well, you’ll find this and more on the shores of Lake Michigan in the Huron-Manistee National Forests! 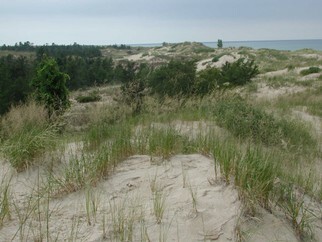 Based within the Nordhouse Dunes Wilderness in Mason County, Michigan, our two-week Passport in Time (PIT) Project will perform 15 National Register of Historic Places (NRHP) site eligibility determinations. The primary purpose for this project is to provide the general public an opportunity to actively participate in the cultural resource management of their National Forests, so why not be one of those?! Participants will hike across the Wilderness in order to complete NRHP eligibility determinations on ten prehistoric- and five historic-period cultural resource sites. We will perform shovel testing, test unit excavation and site monitoring, as well as artifact sorting, cleaning, and cataloging – literally, a little something to fit every retired, aspiring, amateur, expert, or curious archaeologist! We are excited about being able to provide an opportunity like this and we look forward to hosting you in September – see you this fall!